The island is very ancient. Traces which have emerged from the subsoil reveal it was frequented by the Romans, and there are finds from the lst, 4th, and 5th Centuries A.D.. The name is of popular origin and goes back to the fIrst half of the 15th Century, when the island was abandoned for more than twenty years because of the insalubrious state of the lagoon. The Franciscan story begins in 1220: St. Francis landed there with an anonymous companion on his return from the East and was greeted by the joyful singing of the swallows (the account of the prodigy is narrated by St. Bonaventura in the Legenda Maior). 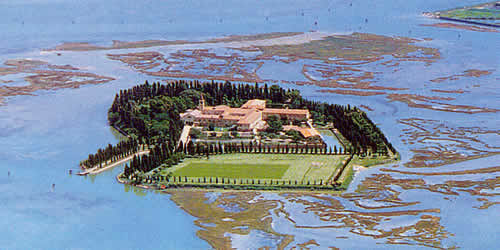 In March 1223 the island was donated to the Order by Jacopo Michiel, who belonged to the doge's branch of the family and was nephew, on his wife's side, to the patriarch of Grado, Angelo Barozzi: at the time of the donation two churches were in existence, of which one was dedicated to the Saint.